"Friendship grows in winter snows, so let's all be jolly!" 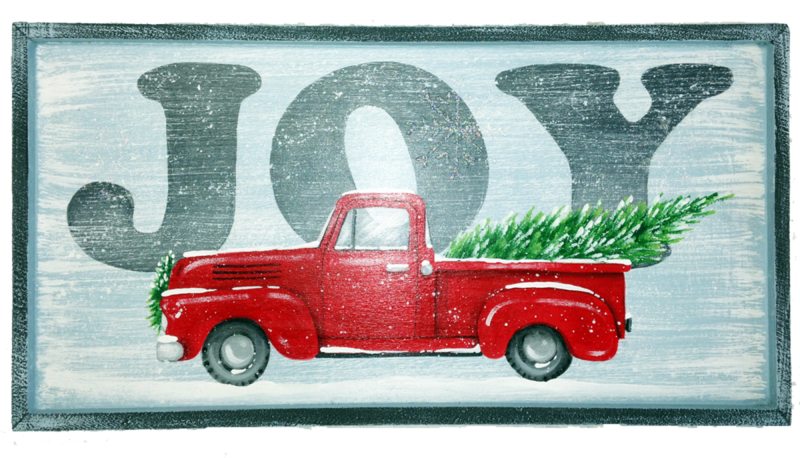 Who could resist a vintage red pick-up truck toting a fresh-cut Christmas tree through the falling snow? The featured surface is a Wood Framed Panel Item #324 available from JB Wood Products (Size: 12-3/8 in. w. x 6-1/2 in. h.) DecoArt Americana acrylic paints are listed. The techniques used to complete this charming painting include dry-brushing, blending, floating color and spattering. Included in this E-Packet are full-color instructions and line drawing. PLEASE NOTE: This item is an electronic download. No physical product will be shipped.